I baked bread on Wednesday with dough that was made on Tuesday. I saved enough to make a pizza. The difference between a crust made with fresh dough and one that has been given a long cold fermentation is night and day. 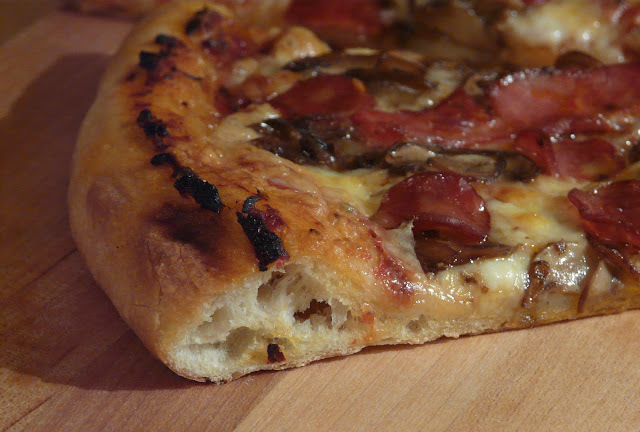 The crust on last night's pizza was perfect, if I do say so myself. This was not specifically a pizza dough either. I used the French Baguette dough. My all time favourite pizza came from a little Italian restaurant in Thornhill, Ontario. Dantes. (Just north of Toronto). They put black pepper in their crust. I'm a serious black pepper fan. I even carry a pepper grinder in my purse. Anyway, for over 20 years I have judged all pizzas by Dante's standards. 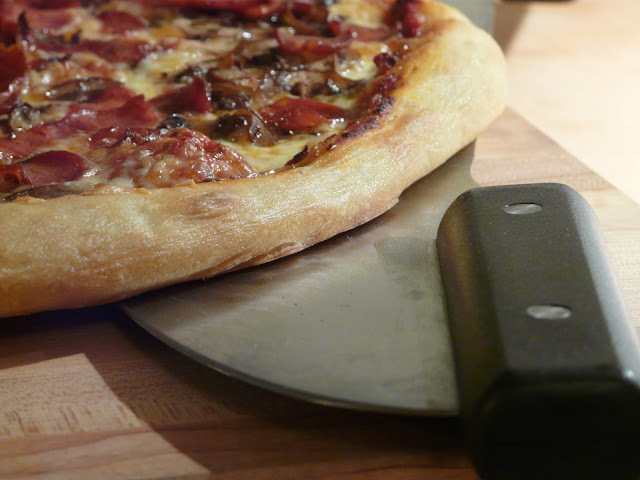 Because I like to bake large pizzas and because my stone is only 16 X 14, I usually start the pizza on a large 17" inch pizza pan just to firm it up, before sliding it directly onto the stone. and baked for about 5 minutes before being dressed with the cheese and other toppings. 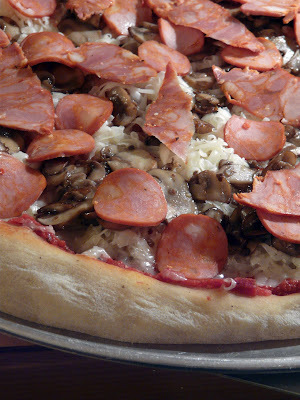 I'm a traditionalist when it comes to pizza and prefer just a few basic toppings. Last nights was topped with just mozzerella, lots of sauted mushrooms and chorizo. (I can't find decent pepperoni). Once dressed it was slid back into the oven, directly on to the stone (which was preheated to 510°F) for approximately 8 to 10 minutes. I let the pizza rest for a couple of minutes before slicing. Looks delicious! Perfect crust. 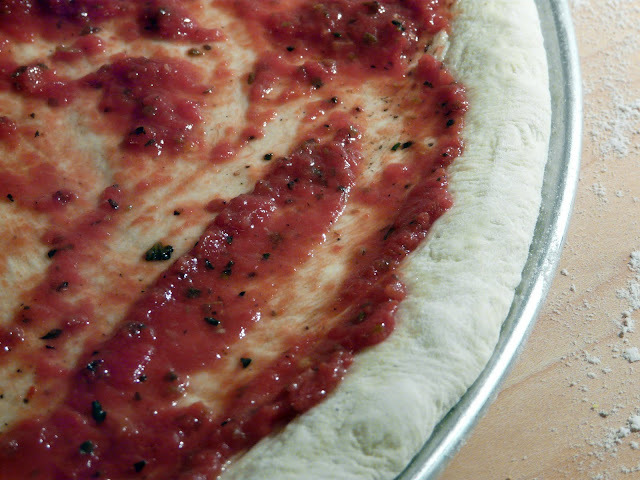 I like that you sprinkled the crust with plenty of black pepper before topping it. I'll do that next time! Black pepper on the crust. What a great idea. Looks scrumptious. 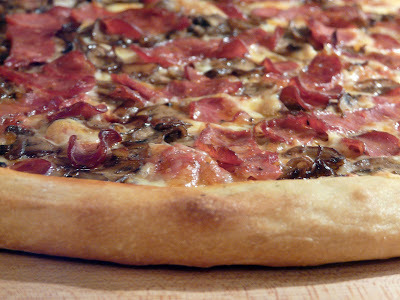 ah la pizza....mmmmm....che buona!! complimenti anche per la foto!!!!! 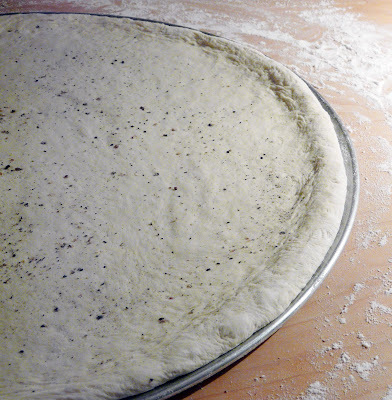 The crust looks wonderful, especially with all the black pepper. Ann, you are absolutely right about the long, slow fermentation ~ the payoff is the incredible texture and flavor. It's like no other pizza crust. Because I usually choose pizza as a quick, last minute dinner I seldom make the long version...but your post and incredible pictures have convinced me to plan for it. Thank you for the tips about how you prebake it, too! I had to giggle a little (I carry a tiny pepper mill in my purse too and have for many years. :)) Sometimes I get some sideway glances when I pull it out to use it, but pre-ground stale pepper just doesn't do it for me. I'm definitely getting on the black pepper pizza crust train ~ what a fabulous idea! Many thanks for all that I learn from you my friend. You are the pizza guru, Ann. Thank you for the refinements in a seemingly simple creation. 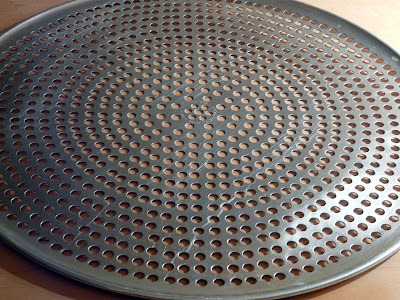 Prebaking the dough on a large pizza pan is an idea I can't wait to try. I wish you did delivery. Your pizza is sensational! The fresh ground pepper does give the pizza a little extra. Mary, My purse grinder was a gift from my friend Sandra. She gave it to me for Christmas about 12 years ago. I've received some strange looks and the odd comment when I pull it out of my purse. Cathy, I had a craving for pizza after seeing yours earlier this week. Thanks for sharing my sauce. Ann, another great looking pizza! I will try the black pepper tip next time. I learn something every time I visit your Blog. What a fabulous pizza ! 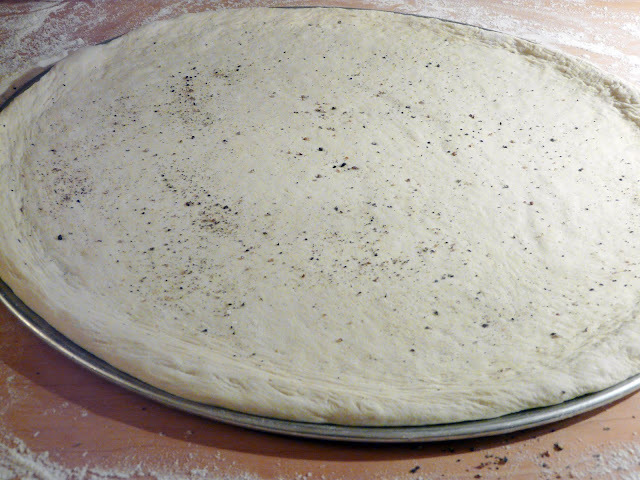 I keep in mind the idea of black pepper in the dough .. I love pepper too ! Your pizza looks divine. We made pizza last night as well. Baguette dough? Wow - it looks great. I also appreciate your sauce directions of using a stick blender right in the can. Long fermentation is the key for us as well. The other night Thumper made pizza for the family, and I have pictures of the chaos. 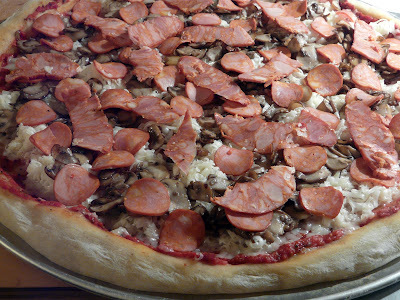 More importantly, we all loved the pie, even if the shape of his pizza resembled the state of Texas.